Every summer, Harvard University opens its doors and welcomes thousands of students from all over the world who have enrolled themselves in an enriching seven-week experience to intellectually challenge themselves. This summer program is the ultimate Harvard experience where students live in on-campus housing, enjoy their meals in Annenberg Hall, take courses under the direction of Harvard professors and build long-lasting friendships. Summer has long since passed but I still think about the unforgettable summer I had this year at Harvard Summer School. Wanting to have a fulfilling summer, I enrolled myself in two psychology courses at Harvard Summer School for the summer 2016 semester. Little did I know, my summer would be more than just academically fulfilling. While I admit it was incredible to experience being a Harvard student for seven weeks, it was not Harvard itself that made my summer so amazing, it was those I met and befriended during my time there. 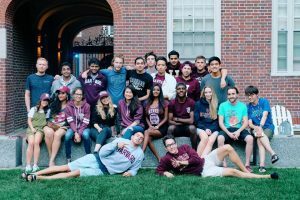 Harvard’s summer program is a 7-week program of running around, academic enrichment and lasting friendships. PHOTO BY LAUREN RAIMBEAULT/ DAILY FREE PRESS STAFF. I was assigned to Quincy House, which housed students aged 18-24. I lived in a single on the second floor. Living in a room without a roommate made it harder to meet people in my building. A little nervous about not making friends, I began to spend time in the Quincy courtyard where I saw others gather night after night. Soon after, I had met the most amazing people who I would become so close to throughout the entire summer. I befriended people from Germany, Canada, England, India, Kazakhstan, Russia and many other countries. I also became friends with people who weren’t from so far away such as students from the University of Arkansas, Syracuse University and New York University. Throughout the summer we all learned many things from one another, whether it was talking about each of our majors and courses, or simply discussing the differences and similarities of our countries, states and colleges. As the summer progressed and friendships were created, bonds grew stronger and romantic relationships sparked, we challenged each other intellectually and emotionally. I learned things about journalism and economics and watched a computer science student program using Java. I was enlightened in subjects that never interested me in the past. Night after night, we would sit by the Charles River and discuss whatever was on our minds. We were our own definition of the nonjudgmental breakfast club. We had learned to confide in and comfort each other as we faced the hardships summer had threw at us — we became a family. Harvard Summer School introduced me to these incredible individuals. I learned things about the world and about myself that a summer at home never could teach me. The people that Harvard Summer School brought into my life truly helped me grow not only as a student, but also as a person. I still miss and think about my Quincy family that parted with in the beginning of August, every day. I am exceptionally appreciative for the experience I had this summer and I am a better person because of it.